Christchurch – A national charity organisation Code Club Aotearoa has teamed up with Christchurch’s Allenvale School on a first of its kind New Zealand initiative to teach high needs students how to think like a computer. The programme has been so successful in unlocking the thinking of the high needs students that some have picked up computer theory quicker than children in mainstream settings. The students are also recognising the benefits that computer science skills provide in helping to expand their future employment opportunities. Allenvale’s new Unplugged Thinking programme uses CS Unplugged (computer science unplugged) open source learning activities adapted by Code Club Aotearoa’s curriculum developer Tracy Henderson and Allenvale teachers to suit the special needs of children with a variety of disabilities, including students with autism. CS Unplugged provides learning activities for in or outside the classroom that teach computer science through engaging games and puzzles. Henderson says every child should have the opportunity to learn to code and there is nothing preventing children with different learning needs from learning the concept of computer thinking. “Computer science is based around patterns and rules and for many of the students at Allenvale this is welcomed learning where they can quickly pick up patterns and what is needed to create any number of unique tasks or programmes. “From what we observed, students at Allenvale were potentially picking up the computer science theories as quick, if not quicker than students from mainstream settings. “These children are valued members of our society and by unlocking their thinking through using computer science, one of them may well be the next person to invent something extraordinary,” Henderson says. Allenvale School’s lead information technology teacher Jenny Gosney says their students love the coding activities and understand the employment opportunities these skills can provide. “Learning code and experiencing a variety of technologies is giving our students real opportunity for employment in the future. We are giving students the chance to see if they have skills in this area and enabling them to work at their pace to be creative, bring to life games they have stored in their heads, to be in control, to build, to play and to learn. 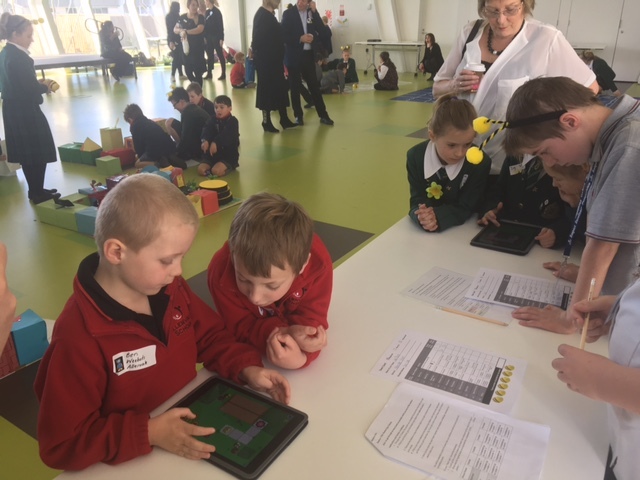 “Bringing coding and computer science unplugged to Allenvale has filled a gap that I think we have missed in special education. Some of our students love rules and structure and are great at debugging. “We have one student who whips through the hour of code sessions and can’t wait to make his own computer games. I spent an afternoon with one student learning binary numbers together and the student got it quicker than me. “The students are highly motivated to take part in coding and like that they can talk the language of their peers by being able to say that they code at school,” Gosney says. The NZTech Digital Nation report released this year recognised the tech sector is constantly challenged by skills shortages and urged faster implementation of computational thinking into the curricula throughout New Zealand schools from year one. “The New Zealand education system is not evolving fast enough to generate local talent to support the growth of the tech sector. It is critical for all children to develop skills to prepare them for the jobs of the future,” the report says. Allenvale is now working to develop Unplugged Thinking across the school so that every class and student can interact with the activities. Some students will also be able to join a community Code Club where they can learn to code alongside their peers. Code Club Aotearoa partners with primary schools and industry and uses the knowledge of a nationwide volunteer network to teach children fresh thinking in preparation for a world of fast growing technology. The charity organisation has been operating since 2014 and already has a total of 265 clubs operating nationwide from Whangarei to Bluff helping more than 5000 New Zealand children.